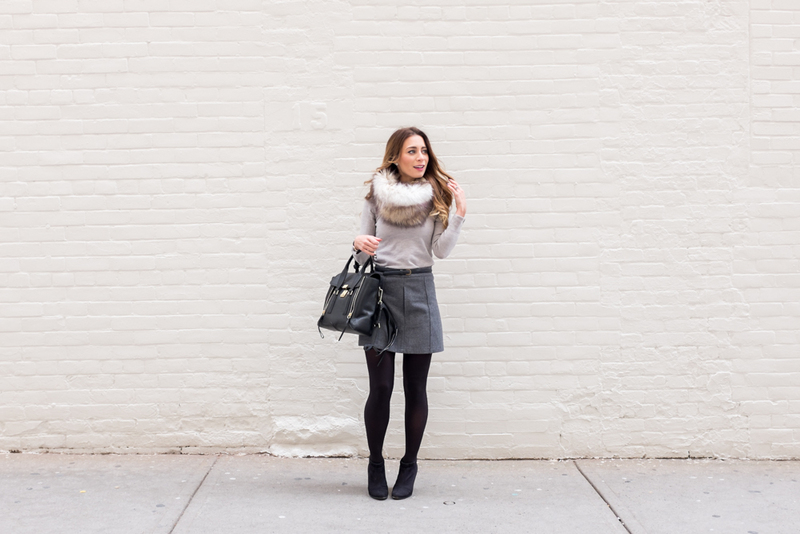 OOTD - Faux Fur Snood and Shades of Grey | La Petite Noob | A Toronto-Based Fashion and Lifestyle Blog. Sporting my Daniel Wellington watch again, seriously one of the best watches for us petite folk since it fits perfectly on my small wrists - no adjustment needed! Use code LAPETITENOOB to get 15% off your order at Daniel Wellington until January 5, 2016. Fist come the snoods, then come the jackets - Winter may be well on it's way, but it's not so bad when you have some faux fur to play with in your wardrobe. Are you into this faux fur trend? What item do you tend to gravitate towards when the cold weather hits? Let me know! Love this look! I am now on the hunt for some faux fur. You make it look so classy! First things first, there's no Target in Canada?!?! I remember reading about Target getting edged out but I didn't think it would actually happen! I love the outfit btw! Just wondering, what do you think is an appropriate skirt length for the office? I know knee length is always the way to go, but I think mini skirts can be appropriate if paired with opaque tights. I'm getting bored with pencil skirts and I think mini skirts can unleash a tidal wave of new outfit ideas! Thank you! That's right Lauren - no more Targets in Canada! It was a sad day when they all left, and I still miss them so much! Thank you for your sweet words, I'm so glad that you like this outfit! In terms of a skirt length, that's tricky. I've learned from comments and feedback from my office outfits on the blog that I work in a fairly casual work environment. I always pair mini skirts and dresses with opaque tights and never run into problems. That being said, it may be worth asking a quick question to HR to get the proper dress code! Such a pretty look!! Love the faux fur and skirt!! I think we've both finally caved to tights weather hahaha. I'm seriously considering a faux fur vest...what do you think?? I think that I love it! I've been seriously searching for a great faux-fur vest for some time, but haven't been able to find the perfect one. Let me know which one you pick up - maybe we can be #twinning once again! I am feeling the breeze as I am reading this post. lol definitely need some fur. You look gorgeous as always!! I totally missed this look and am so glad I was stalking your blog (mutual stalking is okay though), and came across it. You look beautiful, Joelle! Such a luxe outfit! Love this whole look and absolute adore that bag! Please tell me where I can get one.